Discover the best beaches in Nerja, the crystal-clear water and staggering surroundings after a day spent touring around this gorgeous white town. Nerja welcomes some of the Costa del Sol’s most spectacular beaches (you can read about the best beaches in Malaga province here!). Whether they are your primary destination, or you prefer to have them as the perfect relaxing place after a tour around this spectacular white town, the best beaches in Nerja know how to please you. Take a look at all of them and fall in love with your next holiday’s destination. Known as the absolute best beach in Nerja, the 800-mt-long beach of Burriana reached the fame thanks to the famous Spanish TV series “Verano Azul”. Therefore, it is no surprise that the paseo marítimo that flanks this urban beach owes its name to the series producer Antonio Mercero. It provides tourists and locals with all kinds of facilities, such as restaurants and chiringuitos (don’t miss out on El Ayo and its delicious paella), children playgrounds, surveillance service and kayak rentals. If Burriana is considered to be Nerja’s best beach thanks to the facilities, Calahonda wins the “Most famous/spectacular/scenographical beach” prize. Located right under the worldwide famous Balcón de Europa, this beach gets crowded early in the morning. Early birds get the worm here! Despite being located in Nerja city centre, this beach features limpid, crystal-clear waters that invite all the family to take a dip in it. Other facilities are showers, surveillance service in summer and hammock rentals. You can access the beach from the staggering “Boquete de Calahonda”, located in the Balcón de Europa, a breathtaking white door opening onto the blue Mediterranean Sea. Just be careful with the rocks in front of the shore and the steep stairs leading to the beach. The beach of El Carabeo actually englobes the smaller beach of Carabeillo Chico. The first one is 120 metre-long, and it is provided with a small refreshment stand in summer. 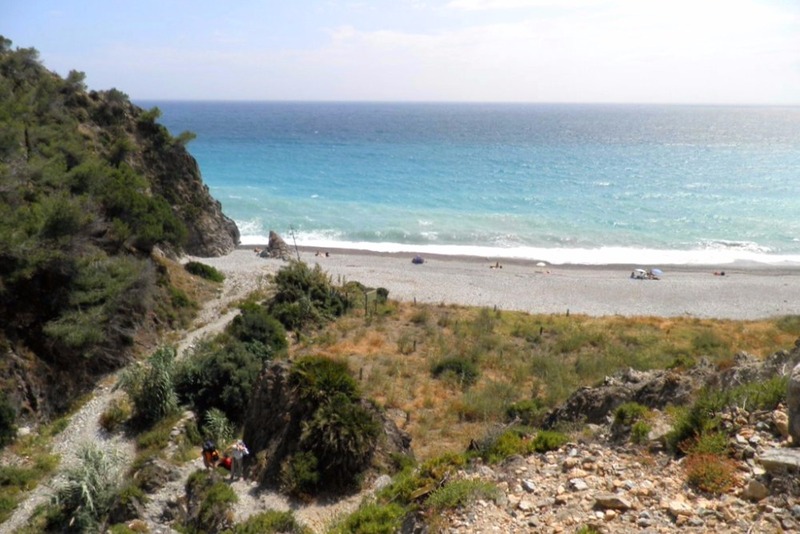 The Carabeillo Chico is one of the shortest beaches in Nerja and, also, one of the most picturesque ones. 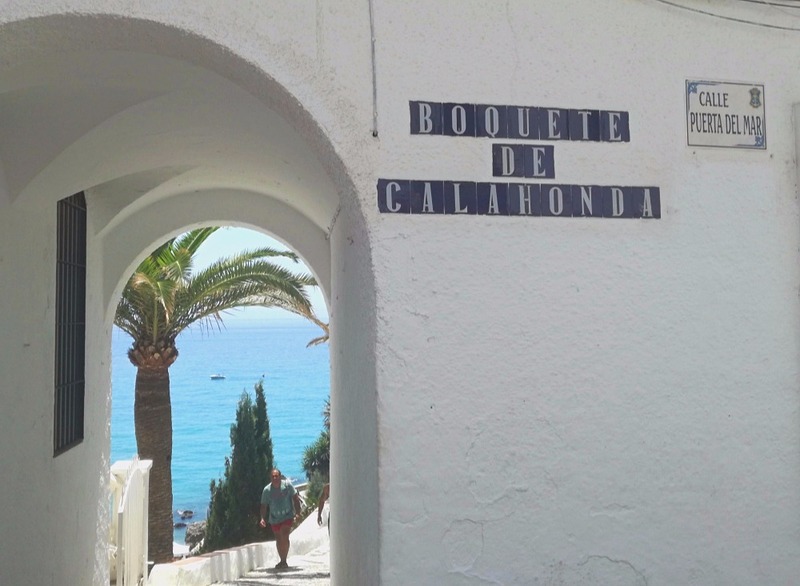 The length of 70 metres and the width of 10 metres make it a secluded spot, ideal if you look for quietness and relaxation right in Nerja city centre. It is an urban beach, but the facilities provided are few-to-none. You can access to it through some stairs from calle Carabeo. 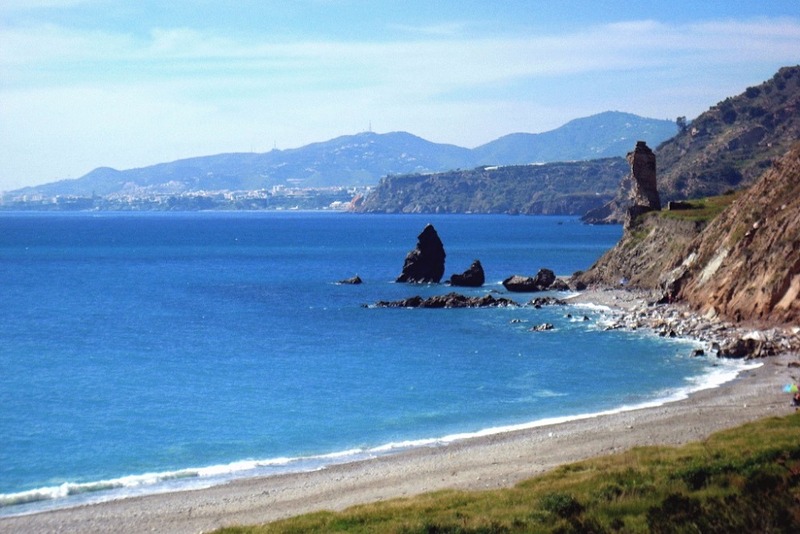 Three small coves located east of the beach of Calahonda receive the name of Los Chorrillos. The three together are 60 metre-long and are sheltered by high rocks, ensuring the ideal spot to do snorkelling. The access is made possible directly from the Balcón de Europa. 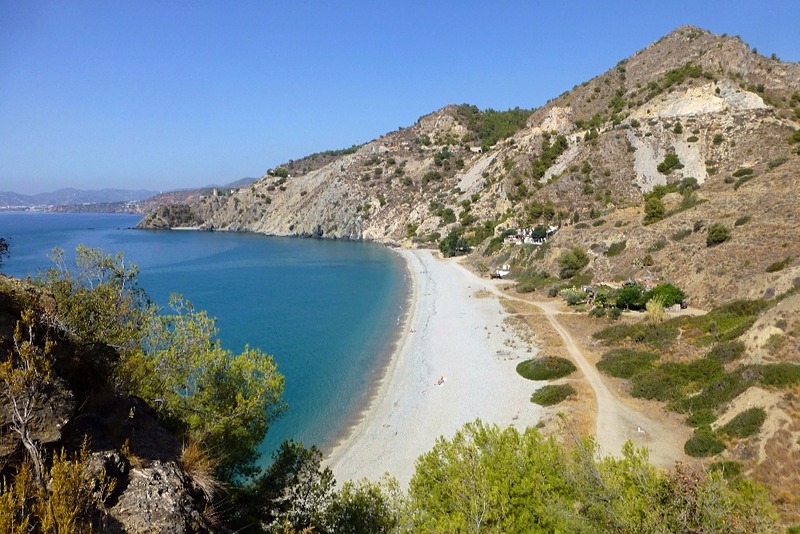 The beach of El Playazo is Nerja’s longest one, and its 1, 7 km is located in the western area of the town. Backed by fields on the outskirts of Nerja, this beach lacks a paseo marítimo, whose absence is mitigated by the chiringuitos and restaurants that face the sea. A 100-place public parking, which makes this beach the ideal place to be if you want to enjoy the seashore in a relative quietness. Right under the eastern side of the Balcón de Europa, you will find this 200 mt-long urban beach. The access is not easy (a twisting ramp leads you from the Balcón de Europa to the sandy shores), but this is part of its charm. Fishermen used to live here, and nowadays, you can still find their homes carved into the rocks. A legend has it that this beach owns its name from the Jewish word “Shalom” (meaning “peace” and “goodbye”), pronounced by the Jewish when leaving the town of Nerja after the Catholic Reconquest in 1487. Located between the beach of El Salón and the Balcón de Europa, at the foot of Hotel El Balcón, this beach is frequently mistaken for a private beach. During the high tide, this beach’s 50 metres completely disappear. The beach of La Torrecilla is Nerja’s second longest beach, attended by both tourists and locals. It has five accesses, three along the beach itself, one at the end and one at the beginning. It features both sand and pebbles so that you can choose the texture you fancy the most. Its 300 metres are annually awarded the Q de Calidad Turística en Playas, as well as the Blue Flag; the facilities provided (bars, restaurants, surveillance system, and even some shops) ensure this is a beach worth stopping by. 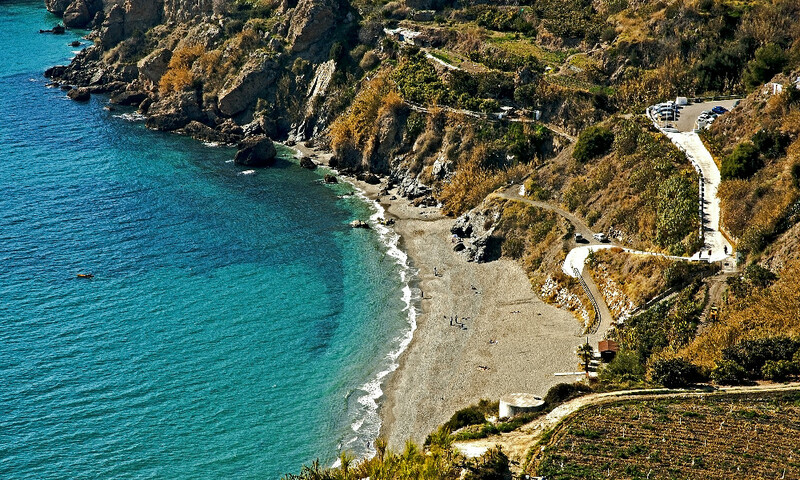 In case you just can’t get enough of the beaches, you can also take a look at the best beaches in Maro, the small village that belongs to Nerja. 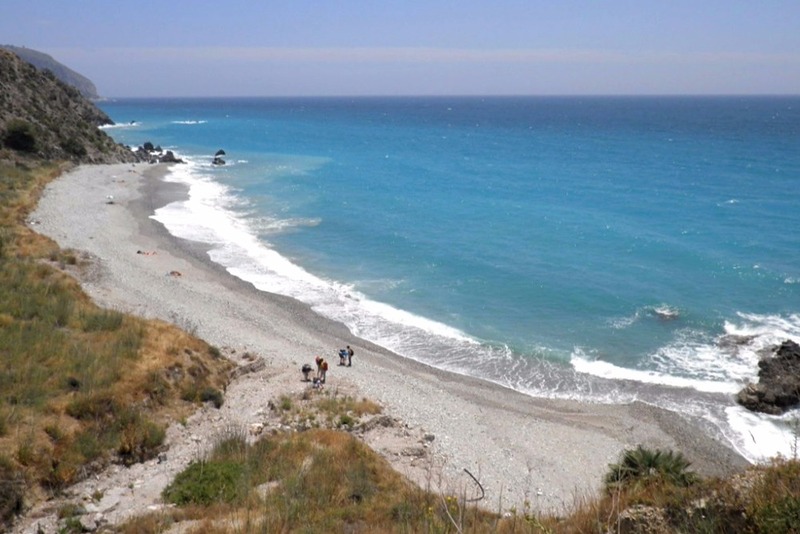 The natural landscape that surrounds this beach is that of the protected area of the Cliffs of Maro – Cerro Gordo, 4 km east of Nerja. The dark sand and limpid waters make it the ideal spot to do snorkelling and spot the marine fauna; fishing is strictly prohibited. In 2014, it was the runner-up of the best beaches in Spain, a selection powered by the Spanish TV channel Antena 3. The access to this spectacular beach is made possible by a path connecting the parking area on the top of the cliff with the beach. The beach features various facilities, among which bathrooms, summer surveillance service and a chiringuito. The so-called Cala Chica (small cove, as the characters of Verano Azul used to call it) is the little sister of the Beach of Maro. It lacks facilities, thus ensuring you enjoy the wild landscapes that surround you. The access is steep, but the other side of the coin is that this guarantees a high level of privacy. The last beach of the province of Malaga (before Granada province) lies in the protected area of the cliffs of Maro – Cerro Gordo. You will have to leave your car at the top of the cliff, and get to the beach by bus (€2 the round trip). However, the staggering landscape that you will enjoy here, is going to make the difficult access worth it. The crystal-clear waters are ideal for spotting the marine fauna and this beach is also one of the favourites among the lovers of naturism, due to its secluded position, away from prying eyes and sheltered by the rocks that surround the pebbled shores. This cove is also attended by naturism lovers, as this beach is almost virgin. You can do snorkelling and scuba diving in the crystal-clear waters, as well as sunbathe on the gravelled shores. The access to the beach is steep, and it features sharp rocks. A virgin beach characterised by a difficult access and usually attended by naturism lovers is the definition of this 400 mt-long beach. 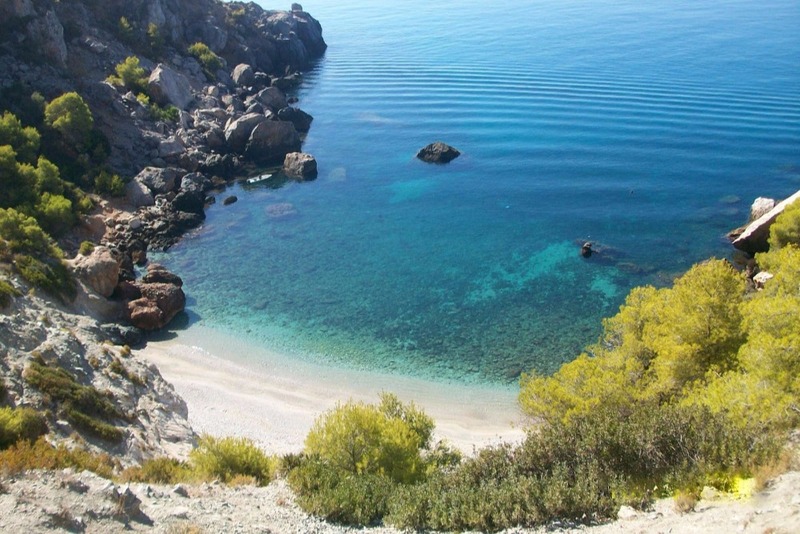 Just like the other beaches in Maro, the beach of Las Alberquillas is a great place to do some snorkelling, thanks to the limpid waters it is provided with, as well as the rocks that shelter the small bay. As it is a natural reserve, it lacks all the facilities. If there were a scale of “virginity”, this rocky, isolated beach in the protected area of the Cliffs of Maro – Cerro Gordo would surely rank first. 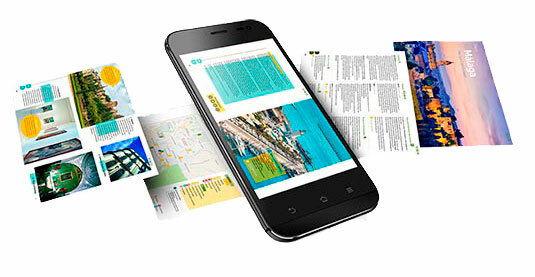 Its name comes from an ancient mill located next to the seashore, where paper used to be made. This beach lies between the mouth of River La Miel and the stream of Los Colmenarejos. The gorgeous white town of Nerja houses countless charming villas to enjoy with your family and friends. 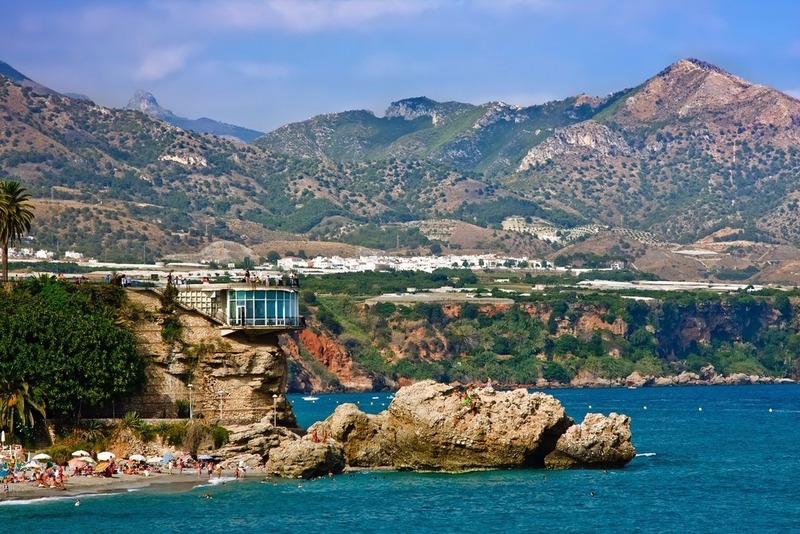 To make the most of your visit, check the best villas in Nerja and the beaches will be just one of the reasons why you’ll choose to spend your well-deserved holidays on the Costa del Sol. BOOK A VILLA IN NERJA! The best beaches in Nerja are a heaven on earth. You shouldn’t miss the chance to visit them! 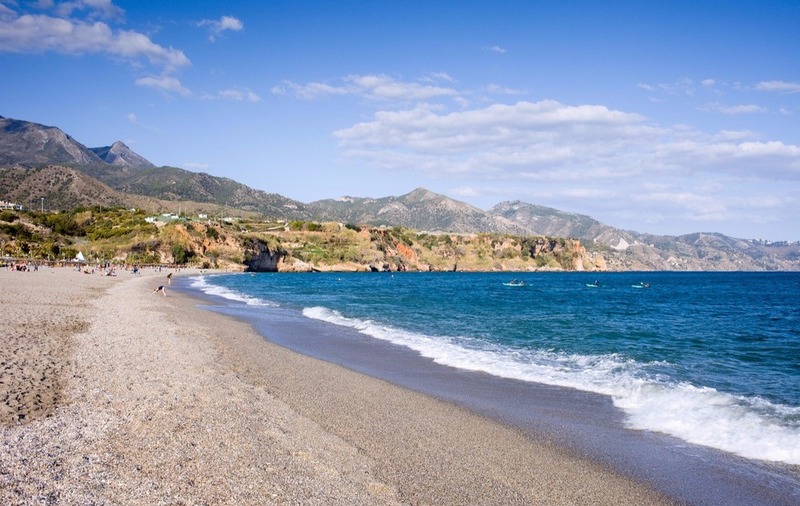 Which is your favourite beach in Nerja? Have you ever been to any of them? Tell us in the comments below!